Through my work on RateTea, I have seen the websites of hundreds of tea companies, far more companies than the brands I’ve sampled teas from. I never realized I’d say this, but I’ve seen dozens of companies come and go as RateTea has persisted through the years, growing into a much more stable business enterprise than many of the companies listed on it. In spite of seeing countless company websites, I never cease to be excited when I discover a newly founded tea company. But my excitement often turns to disappointment when I begin exploring a company’s website in more depth. The primary reason for my disappointment is a company spouting empty marketing platitudes while revealing little to no information about themselves, their history, founder, or vision. My experience has taught me that many of the companies with little information about themselves on their website, are the first to go out of business. 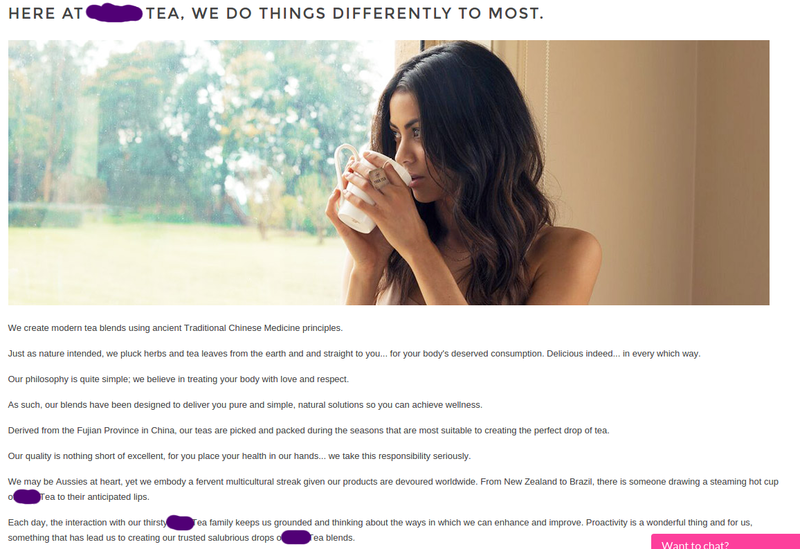 When I discover a new tea company, one of the first things I do is to pull up its website and look at their about us page. This page represents an amazing opportunity for companies to talk about themselves. Seriously, in marketing, how rare is it that you have an audience of people who are specifically wanting to learn in detail about your company? This is the holy grail of marketing, and the about page is the one place on your website where people are going to go when they are specifically looking for this info. And yet, so many companies blow it when they get to this point. This is all the information I was able to find on the company’s website. There is a whole bunch of specific information that I was looking for and did not find. Where is the company based, and where does it ship from? When was the company founded, and how long has it been in business? Who owns the company? (Who is “we”? I find it comes across as suspicious when a company uses “we” to talk about themselves but doesn’t identify their owner, staff, etc.) How many employees does it have and what ownership structure does it have? What makes this company special and different from existing companies? What is the personal story of the people who chose to found it? What inspired the company’s founding? When I see a page like this, I feel suspicious and distrustful. The about page has made some grandiose claims about the quality of the product, while delivering very little in the way of concrete information. The only bit of information I see is that most of the tea is from China; this is the sort of information I want. But even this one tidbit is vague, and is the only example of information of this sort on the whole page. The irony here when they say “we do things differently to most” is enough to make me squirm, as they’re doing many of the exact same things other companies do that I most dislike. This company provides a bit more information than the first, but it still leaves as unanswered the main questions I’d want to ask. In particular, there’s still no owner, no staff, no location, no founding date, and almost nothing concrete about the company. Note how the text says “We may be Aussies at heart” — this alludes to the company or its staff possibly being Australian, but it’s an extremely vague and indirect claim. I also see little other evidence on the site that the company is Australian: it doesn’t have a .au domain, it doesn’t list an Australian address, and doesn’t even show any overt quirks of Australian English. I also have noticed that saying “at heart” is something that people can say when they want to show an affinity for a particular country or ethnic group without actually belonging to that group. For example, I grew up in a city and went to a high school where the largest demographic group were Puerto Ricans, so there are certain affinities I developed for Puerto Rican culture, like how Puerto Rican Spanish sounds like it has “no accent” to me, whereas other dialects of Spanish sound like they have an accent, or my love of Puerto Rican salsa music, or my capacity to eat massive quantities of fried plantains (on their own, like tostones, or in foods like mofongo). So I might say that I’m part “Boricua de corazón”. But I have no Puerto Rican descent, and can barely speak Spanish. If I were marketing anything to a Puerto Rican audience, or anywhere where I thought an affinity to Puerto Rican culture might go over well, I would want to make sure to tell my story specifically so that I didn’t come across as culturally insensitive or exaggerating my claims of connection to the culture. Back to the company pictured here, I want to read a story behind their use of the term “Aussies”: what does this mean? Exactly what is the connection to Australia? Are they based there? If so, I would want them to advertise this. This page talks a lot about health, and uses a lot of buzzwords like “pure and simple”, “treating your body with love and respect”, and “natural solutions”, things that sound vaguely positive and “healthy”, but are vague and ill-defined. The claim “Our quality is nothing short of excellent, for you to place your health in our hands…we take this responsibility seriously.” sounds like the kind of claim I would expect from a health care provider, a pharmacist, or professional herbalist. But I don’t see the company backing up their claims of quality, or even of their products being “pure” or “natural”. What sorts of things would I be looking for? Organic certification maybe? Or citing of the knowledge or research or expertise feeding into the formulation of any blends intended as medicinal products or medicinal teas, which could be anything from traditional use to controlled scientific studies published in peer-reviewed journals. What would be even better is what Traditional Medicinals does, actually studying their own blends and verifying that they have the claimed effect. Look at the specific examples of quality control that this company cites. Another thing that would be great is what Camellia Sinensis Tea House has done, measuring and then publishing the antioxidant and caffeine content of their teas. Don’t want to do this? Then don’t make health claims. I think it’s better to make no claims than to make overstated or overreaching claims. The photos on these sites seem to parallel the text. Both websites have generic-looking photos. The photos look visually or aesthetically pleasing, but they’re not captioned, and they look like they could be stock photos. The first company shows a tea garden, the second a tea drinker. A picture of the warehouse, or a picture of the tea itself being brewed at a company-sponsored tea tasting. I want the company to show me in pictures who they are, what they do, what kind of facilities they have, and what makes them special or unique. What Effect Does This Have On These Companies? I can’t speak for others but I am extremely reluctant to buy from a company with a vague about page, especially when paired with equally broad or vague marketing materials. I’m especially turned off by the bold and general claims like selling “the finest teas” of “the highest quality” and stuff like that. But in my case, I have a much bigger effect on a company than that of a typical individual or potential customer: I can choose whether or not to add the company to RateTea, and I can also choose whether or not to promote the company through sharing their materials or information about them on the various RateTea social media accounts. RateTea receives a staggering amount of submissions of new companies wanting to be listed on the brands page, and an overwhelming majority of these either get rejected or held in the queue until there is a specific request from an established user or reviewer on the site to add that company. The main reason I don’t list companies is that I don’t feel I have enough information about them to verify their legitimacy. If I’m on the fence of whether or not to add a particular company, my impression of the company from their about page is often something that puts me clearly on one side of the fence or the other. I know from experience that most companies that submit themselves to RateTea and have about pages like the ones pictured and described above usually attract few or no reviews (and few or no views), and in many cases, go out of business after less than a year. 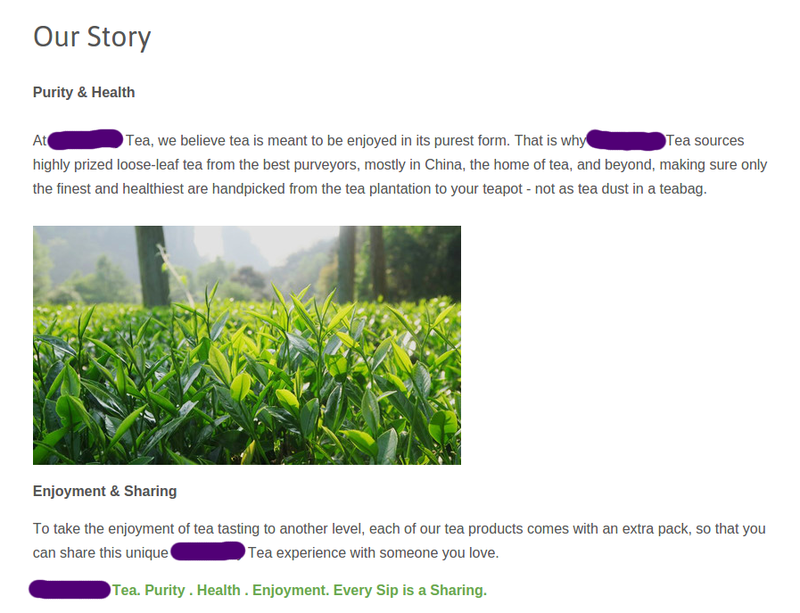 I put care into researching companies to create their page on RateTea, linking them up with social media accounts and sometimes even highlighting external news coverage of anything special or interesting the company is doing. It takes time, and I’m not willing to put in this time unless the company has put in the time to present themselves in a professional way that demonstrates that they have good business sense. Are companies even moving in the right direction? What did I like about this page? The page began by introducing the founder and date of founding, and told a story about the founder’s inspiration and motivation behind the company. The introduction led into a story about the company’s history and growth in a way that introduced their products in the context of the changes the company has been through. In the course of this story, you could learn where the company is based and be introduced to other people involved in the company as well as the various facilities and business relationships that the company has. The page explained the deep meaning behind its name, which made it seem more meaningful. The photos were actual photos of the company’s current and original headquarters. The effect? Rishi Tea seemed very real to me. This about page conveys legitimacy in a powerful way. As I read it, I learn more about the company, and it feels personal. I wish more new companies would follow the lead of companies that take this sort of approach to their about page. Why companies don’t reveal personal information and a personal story is completely beyond me, but it doesn’t seem to be good business practice. I have a sneaking suspicion that if these new tea companies had better about pages, they’d probably do better business and they would be more likely to survive the first few years of operation. It’s not exactly horrible…but gone is any mention of the specifics of ownership, founding, and the story of the company’s growth. The page now speaks in broad generality, and it makes a lot of grandiose claims, calling themselves “the vanguard practitioner of tea and botanical arts”. Really now? I love Rishi tea but this ridiculously exaggerated language has me scratching my head. 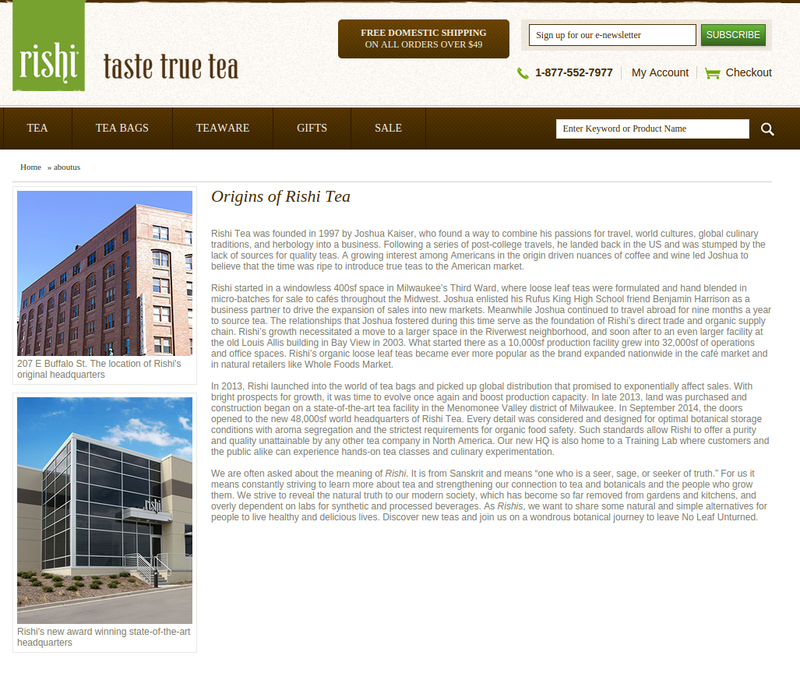 I still trust Rishi Tea, but that’s not because of their new about page, it’s because I know them. I have tried many of their teas over a period of many years, I have met some of their employees in person at tea conventions, and I know small businesses that use them as a supplier. If I were learning about them for the first time, though, their about page would be insufficient to establish the sort of trust that their old about page did. It would probably make me a little skeptical. I feel sad when I see a company make a change like this, one that seems to be moving in the wrong direction. I like Rishi’s new site overall; it’s prettier, it uses responsive design and looks much better than the old one on either very narrow or very wide layouts, and it’s easy to use and navigate. But I wish they could have retained those great elements of their old about page, the ones that made the company seem more personal and real to me. Any company with a sufficient budget can pay someone to make a pretty website, but only the owners and key personnel in a tea company can tell the story of the company’s founding, struggles, growth, and successes. And, in the day and age of the internet and online interactions where interpersonal trust is hard to come by, I ultimately find these stories, especially when they are full of concrete details and specifics, to be the best way for companies to establish this sort of trust and legitimacy. I want to see Rishi Tea, and all the other tea companies doing great things, succeed and thrive. Why are they shooting themselves in the foot like this? How do you react to about pages and marketing material like those pictured above? Is your reaction similar to mine? Can you think of any legitimate reason that companies wouldn’t want to share identifiable information like location, ownership, and founder and staff names, or is this really just a self-defeating oversight and a missed opportunity? What advice would you give companies for things to say (or not say) about themselves on their about page or other marketing materials? Are there any things you would advise differently from what I do, such as things I’ve omitted, or things I recommend saying that you don’t think are always the best ideas? Am I just a weirdo? Am I the only one who has these negative, distrustful gut reactions to these vague about pages spewing broad generalizations and providing few details? Categories: Original Posts | Tags: advertising, business, communication, health, marketing, tea, tea companies, trust, websites | Permalink. I am the founder and editor of RateTea, and am also a co-founder at Why This Way. I am committed to sustainability in every aspect of my life. I like describing my approach to life as "ecological" because it is both scientific and holistic. Something tells me that Rishi hired a marketing/webdesign-guru who “knows better” according to some marketing-fairytale. The text looks more designed instead of from the hart. I find the webpages of small shops/organizations often like it is an afterthought. I think a lot of people don’t realize the importance of a proper webpage for a shop/organization and what that means in terms of time/effort/thinking investment.